The Dobyns Weedless Heavy Wire Hook Swimbait Heads are ideal for matching with swimbaits and grubs to slow roll bottom contour as well as to match up on an Alabama Rig. 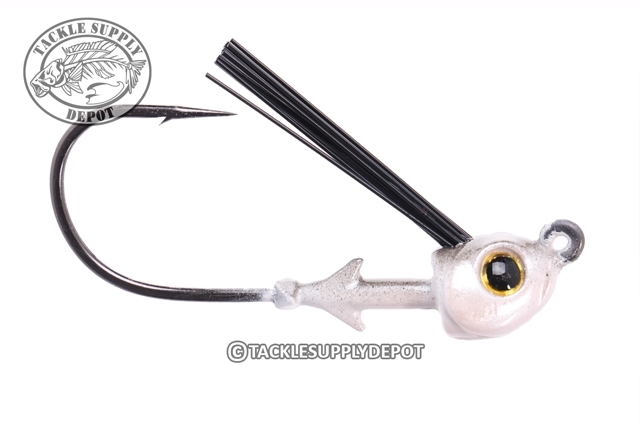 The heavy wire hooks make these heads perfect for dealing with big fish and applications where alittle extra muscle is needed. The weedguard delivers added protection for fishing around snaggy cover and vegetation. These heads feature a 30 degree hook angle which keeps the swimbait more balanced as well as more natural movements and subtle rolling actions. The shad shaped head design complements many swimbaits and grubs on the market as well as allows the head to help roll over rocks and hard surfaces with less resistance. The Dobyns Weedless Heavy Hook Swimbait Heads are finished off with a double collared four barbed bait keeper system that keeps baits locked firmly in place.